Acronyms make language learning the task of an entire lifetime. SDM(R)’s been around for a decade and–no surprise–I’m only just learning it. Any guesses what SDM(R) expands to? A clue is that it relates to the vessel below, which–I’m told–isn’t exactly an SDM(R). I’m not sure who took the foto; it was passed onto me. It’s the first–after over 1500 fotos–to go unattributed. Tell me you took it, and I’ll credit you. It’s a tractor tug, 90′ x 34′ 147 tons and 2400 hp. Hvide Marine in the southeast operates this vessel. 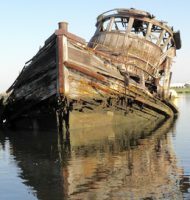 If you open any links at all here, you must see this foto of a French SDM(R) of this design on the high and dry. It has ADFs, azimuthing drives forward. Many more tugs and pushboats here. Here are here are Rolls-Royce brochures, but they show only ASDs, azimuthing stern drives, not ADFs. 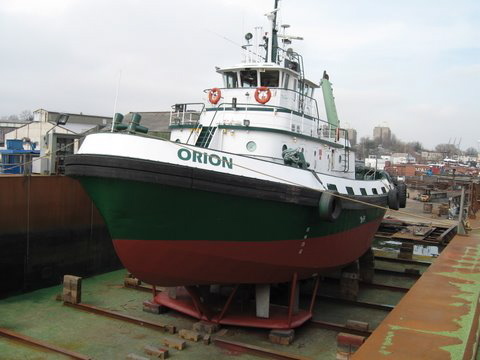 Below is Orion, the VSP tug (now back in Boston) that started out this series on unconventional propulsion. Notice all the green recycled glass around the drydock, detritus of the “sandblasting” process. Foto thanks to Ted. 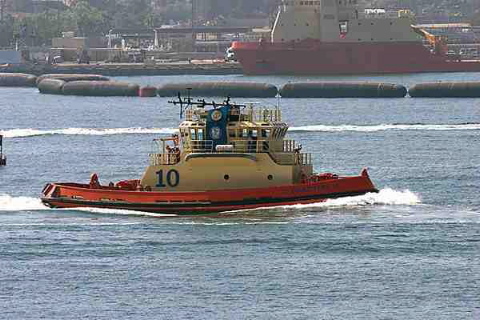 Finally, here’s a succinct tug design history lesson link to a Marcon International Inc. article entitled “aesthetics of tug design.” The article includes a foto of a Miki tug design. SDM(R) is located at this link showing both fotos and drawings showing the fore and aft location of the thrusters aka wheels. The vessel’s vitals: 76′ x 50,’ egg-shaped. Facinating. We have these in San Diego….where one of the French research vessels lives behind the barrier with the carriers.